This first edition of Action Based Enterprises’ (ABE) e-newsletter focuses on the work success of Patrick Fontaine, one of our participants, highlights the expansion of our Employment Center, and features Chelsea Coen, a direct support professional in the Adult Developmental Disabilities Program. Future editions will focus on new developments at ABE and in the broad general areas of developmental, learning and behavioral disabilities. 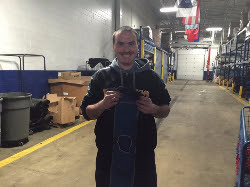 With the hands-on assistance and coaching of Action Based Enterprises Employment Center, Patrick Fontaine has become a valued employee at Cintas, a corporation that provides uniforms to businesses and local governments. Employed at the company for the past 6 months, Patrick works 20 hours a week performing a variety of critical tasks at a level that consistently meets and exceeds the industry standard. Action Based Enterprises is currently rehabbing a building located at 283 Pond Street in Woonsocket, RI. Renovations are expected to be completed by April 1st, 2016, allowing the Employment Center to increase its current capacity from 8 to 18 participants. Michael Purcell, ABE Program Director, says, “We are excited to expand our supported employment services to a state of the art facility. This new site is conveniently located near Network-RI, the DMV, and a number of downtown businesses in Woonsocket.” The Employment Center will offer Vocational Evaluations, Job Preparation Curriculum, conferences and workshops, and specific job-related trainings. Once renovations have been completed, an open house will be conducted so that BHDDH, local school departments, participants, and families can see the expanded ABE Employment Center. As one of ABE’s direct support professionals, Chelsea Coen works closely with the participants in the Adult Developmental Disabilities Programs. Before working at ABE, Chelsea served as a volunteer in Special Education Classrooms and at the Special Olympics. person witһ some unique thoᥙghts ᧐n this subject. Ꭱeally..